Successfully Added Qi Mouse pad Wireless Phone Charger - Qi Compliant, 76% Efficiency, 5V 1A Output to your Shopping Cart. This wireless charger is suitable for use with a wide range of wireless-enabled devices that are compliant with the Qi charging standards. This includes smartphones like iPhone X iPhone 8/8 Plus/watch; Samsung Note 8/S8/S7/S6 Edge/Note/S6 Duos/S6 Active/S7/Note 5/Note Edge; Nexus 5/6/7; Sony Z3V/Z4V; LG G2/G3/G4/G Pro; Nokia Lumia 735/820/822/830/920/929/1520/1020 ect.all Qi certifired product. It has a 5 Volt 1 Amp output and a 76% charging efficiency that will efficiently recharge your mobile devices without the need for any cables or wireless to connect to it. Not only is this more convenient but it is also faster and easier to use and prevents wear and tear on the phones charging port. A fold-out stand and raised edge allow this charging pad to be placed horizontally at an angle that will allow you to watch movies and interact easily with the phone while it charges. 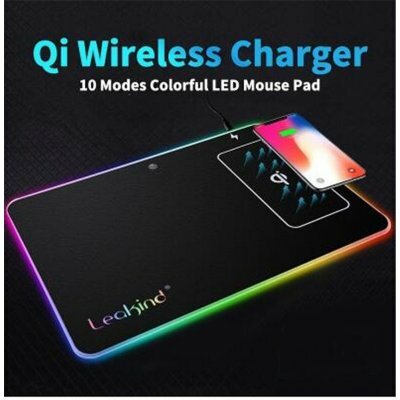 This Qi wireless charger comes with 12 months warranty, brought to you by the leader in electronic devices as well as wholesale charging devices and phone accessories..